Manor Park stands in the former gardens of Glossop Hall. 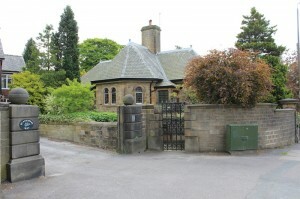 The grounds were bought by Glossop Borough Council (now High Peak Borough Council) when the Howard Family – Lords of the Manor – sold their estate in 1925. Two years later Manor Park opened to the public. The Howards inherited the Manor of Glossop in 1606 when Thomas Howard, 14th Earl of Arundel married Alathea Talbot. 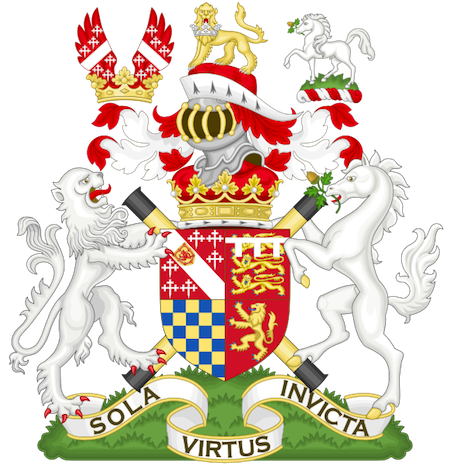 The Howards – Dukes of Norfolk – and Talbots were the two premier families after the Royal Family. For more than a century the Howards took little interest in the estate; the poor soil and climate raised very little farming income. 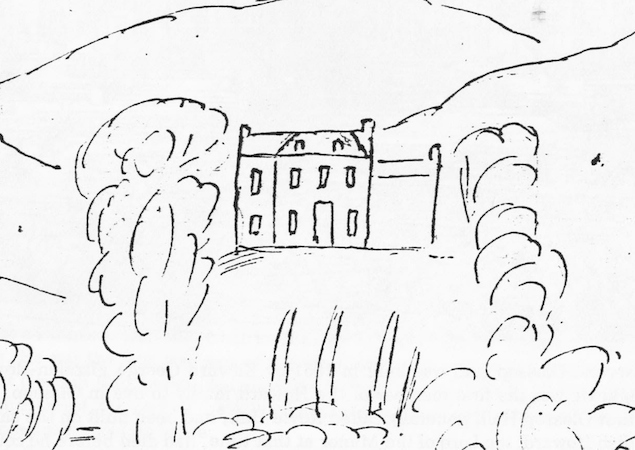 In 1729 Ralph Standish-Howard built a small hall on land just outside Manor Park – all the evidence we have is this sketch – but he and his infant son died before it was completed. During the next century the family only used Royle Hall as a hunting lodge. In 1852 the 13th Duke of Norfolk’s son moved into Royle Hall, and extended it to include two large wings. From this point it was known only as Glossop Hall and he oversaw the collection of rents from the mill owners who had built mills on their land, initially in Old Glossop and then Howardtown when the cotton mill industry really took off. Glossop Hall and its grounds were enclosed by a high wall and some old established roads and tracks were redirected out of sight. Areas to the north between the hall and stables became a walled Italian garden and formal terraces ran east. A walled kitchen garden, fishponds and hothouses provided food for the Hall. The original entrance to the Hall was lost when the turnpike road (later Norfolk Street and Woodhead Road) was built in the late 18th century. Over the years a succession of drives were laid from the main turnpike. Entrance gate posts and a coachman’s bungalow can still be seen on the corner of Norfolk Street and Hall Meadow Road. A separate ‘back entrance’ from Church Street, across Hall Meadow, came to the back of the hall and stables. There was also a Gatekeeper’s Lodge on Hall Lane, opposite the Tabernacle Wesleyan Chapel. The Cotton Famine of the early 1860s caused by the Civil War in the USA put the cotton operatives out of work. Lord Howard and the Board of Guardians paid for a programme of road building which gave Glossop many of its present main roads. The unemployed workers also drained agricultural land and built several of the reservoirs we see today. By the end of the 19th century the local cotton spinning industry was in decline and many mills stood in ruins. Yet it was the increase in death duties imposed by Lloyd George’s government that finally forced the Howards to sell up and end the families residence in Glossop. They also wanted to maintain their very nice palatial manor house in Yorkshire, which they preferred. 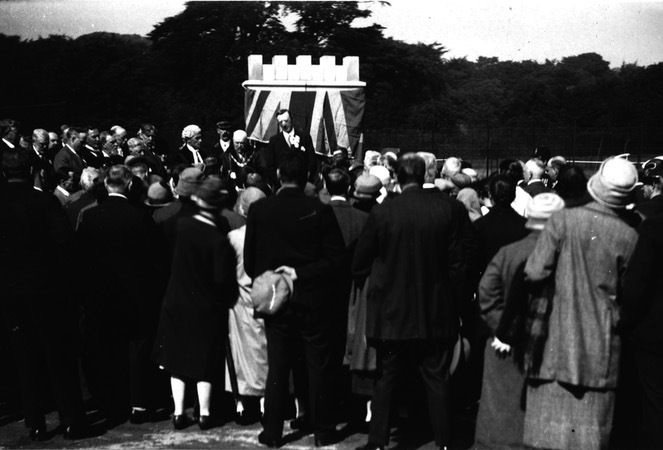 The main grounds were opened to the public as Manor Park in 1927. The Hall became Kingsmoor School until it was demolished in 1958/9 when the cost of upkeep become too much. Some of the pillars and other ornate stonework were incorporated into the new estate of bungalows that were built in its place – now called Old Hall Close and Park Close.